Ajith’s latest movie, Viswasam, after the 2017 hit Vivegam continues to prove why the superstar is one of the biggest names in Indian cinema. Released on the same day as Rajinikanth’s Petta, Viswasam has performed extremely well at the Indian and overseas box offices – it makes one think if Viswasam would have become an even bigger hit had it not clashed with another big release. 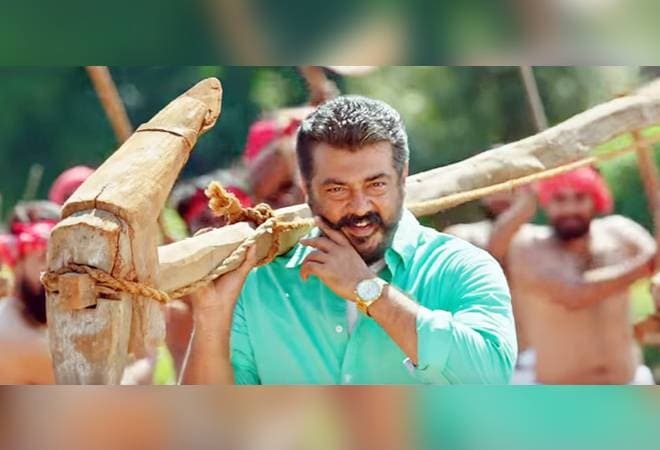 Both Petta and Viswasam were released just in time for the Pongal holidays – a gamble that paid off for the two movies as they near the Rs 200 crore mark. Rajinikanth’s fan-following abroad meant that Petta was going to record strong numbers. However, Viswasam, with its collections proved that it is not a second choice. To begin with, in Malaysia, the Siva-directorial pulled up its socks in the second weekend to register a higher collection than Petta that was otherwise leading. Viswasam made more than Rs 51 lakh on the second weekend as Petta earned over Rs 36 lakh. More screens yet to report..
Viswasam made Rs 1.50 crore in UK and Rs 3.48 crore in Singapore in 11 days. In Australia, the movie made Rs 77 lakh. Ajith’s movie made Rs 2.23 crore in Sri Lanka as Petta made Rs 2.04 crore – one of the few international markets where Viswasam registered higher numbers than Petta. Closer home, Viswasam is unstoppable. In Chennai alone, the movie has made close to Rs 10 crore. While the collection is brilliant in itself, there is a catch. “Most cineplexes have allocated their smaller screens, hence despite sold out shows, the total gross is on the lower side,” tweeted trade analyst Ramesh Bala. Directed by Siva, Viswasam is the fourth collaboration between the actor and the director. Their last movie together was Vivegam in 2017. While audiences loved the movie, Viswasam struggled to impress the reviewers. Ajith’s Viswasam stars Nayanthara, Jagapathi Babu, Anikha and Vivek.